With a NORMACONNECT® coupling and a torque wrench, anyone can connect high- pressure pipes in minutes — and they'll stay sealed. Rugged NORMACONNECT® couplings are 70% lighter than welded flange joints and take up 40% less space. They also: • reduce noise and dampen vibration • save time previously spent on welding and x-rays • compensate for misalignment, angular deflection and variances in pipe O.D. • eliminate the pipe grooving and end treatment necessary with other couplings • feature a patented double-lip seal • are available in all IPS nominal O.D. 's, from 3/4" to 48" (26.9mm to 1220mm) • are rated at 16 bar to IPS 8.0" (219.1mm) by all major marine approval bodies. NORMACONNECT® Pipe Couplings. They're used on everything from ocean-going passenger ships (e.g., the first ones built in the U.S. in 40 years) to semi-submersible oil rigs. A WORLD OF INNOVATIVE SOLUTIONS. Notwithstanding the hysteria surrounding it, Y2K turned out to be a non-event, but it did produce an unintended consequence. 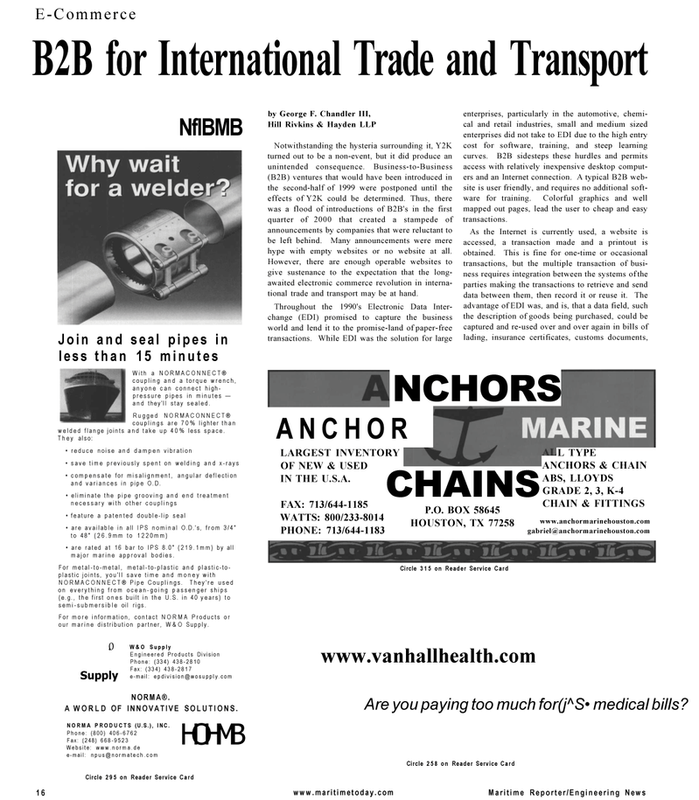 Business-to-Business (B2B) ventures that would have been introduced in the second-half of 1999 were postponed until the effects of Y2K could be determined. Thus, there was a flood of introductions of B2B's in the first quarter of 2000 that created a stampede of announcements by companies that were reluctant to be left behind. Many announcements were mere hype with empty websites or no website at all. However, there are enough operable websites to give sustenance to the expectation that the long- awaited electronic commerce revolution in interna- tional trade and transport may be at hand. Throughout the 1990's Electronic Data Inter- change (EDI) promised to capture the business world and lend it to the promise-land of paper-free transactions. While EDI was the solution for large enterprises, particularly in the automotive, chemi- cal and retail industries, small and medium sized enterprises did not take to EDI due to the high entry cost for software, training, and steep learning curves. B2B sidesteps these hurdles and permits access with relatively inexpensive desktop comput- ers and an Internet connection. A typical B2B web- site is user friendly, and requires no additional soft- ware for training. Colorful graphics and well mapped out pages, lead the user to cheap and easy transactions. Are you paying too much for(j^S• medical bills?